Whole Foods on Lamar is by far my favorite grocery shop here in Austin. 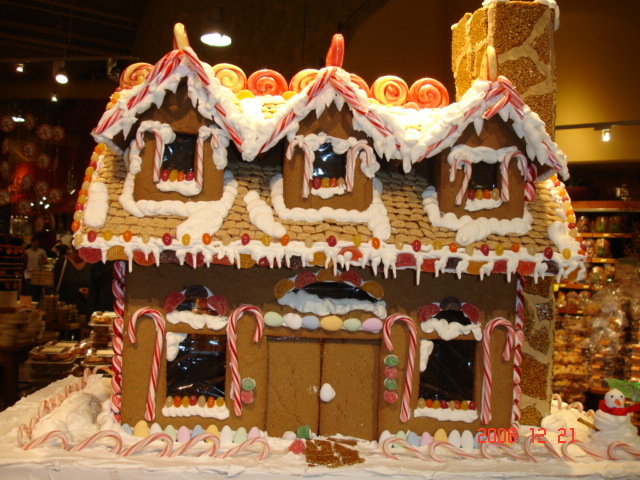 The photo above is a gingerbread house that they have on display there. Last year, my husband’s family decided that we would make gingerbread houses. I have to go on record and state that none of ours looked remotely like this one. I made one from a kit, so obviously, it was not this elaborate. The only one that even came close was my mother-in-laws and that is only because she hand-made the gingerbread. I love to go and walk around Whole Foods. There is so much going on and it is like a feast for the eyes to look at all the good food on display! I have gone there for breakfast several times and even eaten there for dinner on occasion. The food is always good! I have to admit that I rarely grocery shop there, however. I’m not really that picky about everything being organic. I really just like being in the store! They usually have great samples out. Last night, they were sampling brie with some kind of fig jelly. I’m glad we happen to be there!